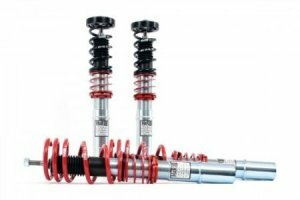 H&R Coilovers - Street Performance Coilovers: H&R coil overs are engineered for street use. Unlike traditional twin-tube shock absorbers, H&R Coil Overs feature a state-of-the-art mono-tube gas shock construction. Combined with the knowledge and skill of H&R's suspension engineers, the use of this state-of-the-art technology results in the best suspension product that you can buy for your vehicle. H&R is the originator of the true coil over system for the street and continues to lead the market with an extensive line of applications. Each shock is tuned with a progressive rate spring that is engineered from its inception to work with the shock's valving, creating a finely tuned suspension system. H&R Coil Overs are the suspension answer for everybody, from daily drivers to the serious tuner. © 2019 N5tuner. All Rights Reserved.